1CLICK offers a cloud-based platform that enables businesses to proactively connect in real-time with their customers via video, voice and text chat as well. Through our multi-channel customer engagement platform, we also give you the option of connecting with your customers through a live text chat. Live text chat is a very simple tool that every online user has used before. Once a customer has connected in a call, you can continue to text chat with him/her after disconnecting, as long as the tab is open on the customer’s side. 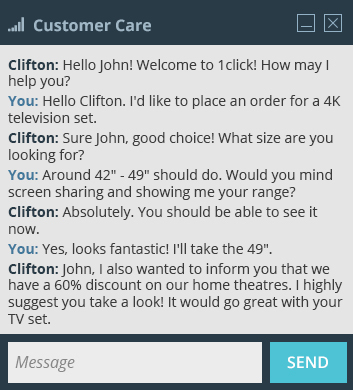 1CLICK provides a simple interface on both the customer and agent front for text chat. At any point, if a customer calls without any video or voice for you to chat with, you can fall back and rely on our text chat feature. 1CLICK’s Live chat software adapts itself to these situations so that you do not lose out on interacting with your customers. The software goes into an ‘audience’ mode when the customer does not have any equipment for a video or voice chat. 1CLICK’s live chat support software’s text chat feature is completely free of all charges. There are no hidden charges involved and we encourage all our customers to use this tool to their requirements. We encourage all our customers to try our text chat. When customers or agents do not have the required equipment for video or voice chat, they prefer this solution. Increase in conversions on websites. Get live support on your website.